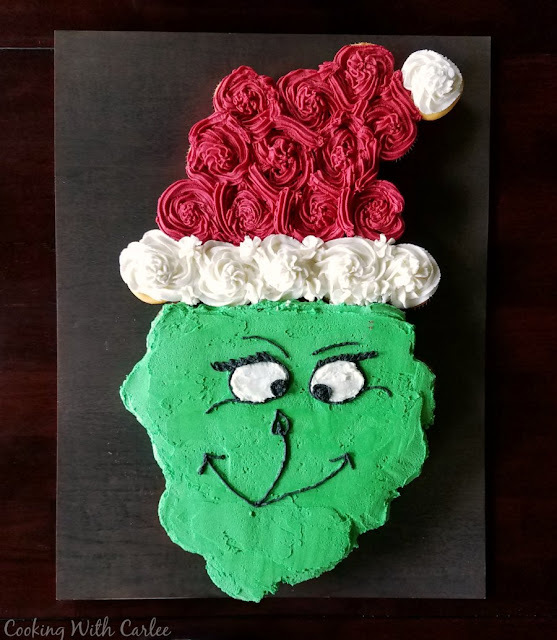 Make a fun Grinch face cake out of cupcakes! 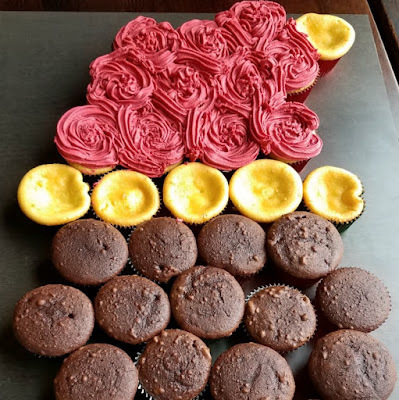 It is perfect for a party and everyone can just grab a cupcake when they are ready. 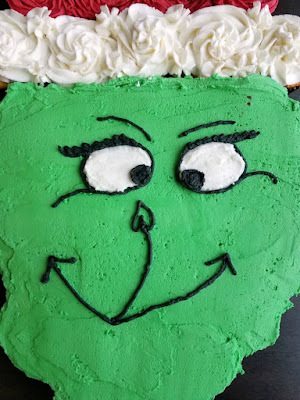 This fun Grinch cupcake cake is perfect for a Dr. Seuss themed classroom party, birthday party or even a fun twist on Christmas dessert. It is sure to get a reaction and once it is time to serve, everyone can just take the cupcake they'd like. You don't even necessarily have to have plates and forks, people can just grab and go! I promise I will stop posting Dr. Seuss themed food soon. But we had so much fun planning the party, I can't help but to share some of the fun details. Besides, when I was looking on Pinterest for ideas for this cupcake cake, I found plenty of cute examples but no tutorials. 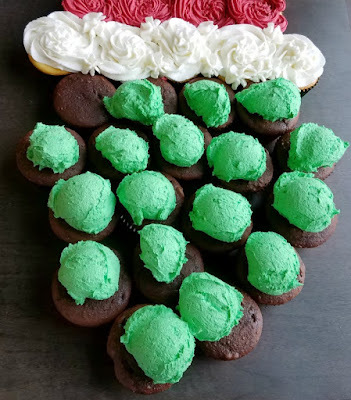 When the cupcake cakes are iced well, it is hard to tell what is under there so deciding where to put the cupcakes is a struggle. So I adlibbed a bit and ended up with a pretty cute cake if I do say so. I figured I'd give you a quick photo guide so it might be a little easier for you! I have to say the guests at the party were pretty impressed with Mr. Grinch, but none more than Little Dude himself. I am really going to miss it when he is too old and cool to appreciate all of this kind of stuff. He wanted to eat one of the eyeballs and his friend went straight for the ball on the tip of the hat. So here is a quick guide to what I did and you can adapt from there! 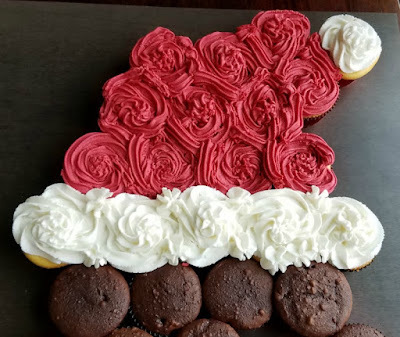 I used 35 cupcake to make the basic shape. These were a mix of the semi-homemade chocolate cupcakes and a white cake recipe I am still tinkering with. You could probably sneak a few more in if you were feeding a bigger crew. Just be sure to place them as close together as possible. This will make frosting them a lot easier. It takes a lot of frosting to make a cupcake cake if you want to fill all of the gaps. You don't have to eat it all if you aren't a frosting person. I know you non-frosting people exist, but I just don't understand it. (Frosting for life!) Or you can just save the extra frosting bits for me. A nice big double batch of buttercream is about the perfect amount to get the job done. Take about a quarter of the frosting and dye it red. I always have a hard time adding enough dye to get a deep red, so I added a teaspoon or two of cocoa to that bit of frosting first and then some red food gel. It made the red a little less pink without having to add the whole bottle. 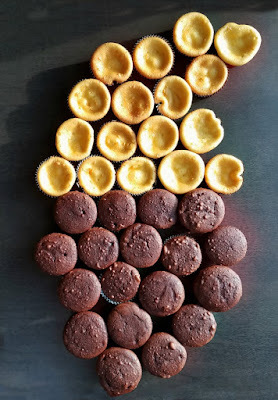 Make sure to leave the bottom row and the very tippy top cupcake plain. Then load up a piping bag and swirl the frosting all the way to the edges of the hat cupcakes. Go back and add some squirts to fill in any gaps to make a solid red frosting hat. I was experimenting with a different tip than I normally use and didn't really like the effect, but it turns out once it all comes together it doesn't matter if something like that is perfect. Next load up a piping bat with some white frosting and pipe a big fluffy rim to the Santa hat and a big fluffy ball on top. Now set aside a little bit of frosting for the whites of his eyes and some black for his eyes and face. Dye the rest of the frosting green with food gel. Then take a large cookie scoop or small ice cream scoop and scoop a nice blob of frosting on each cupcake. Then smooth it all out covering all the gaps between the cupcakes. 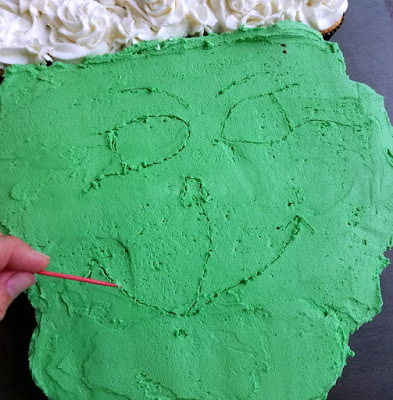 Add frosting where you need it to make a nice base to your Grinch face. You can freehand the face if you'd like, but I felt better tracing it out with a toothpick in the green frosting first. That way I could be sure the scale was about right and if I got it wrong I could just smooth the frosting out and try again instead of scraping off frosting and hoping I had enough left for a second try. Next just spread the white frosting for his eyes where you'd like. Load up another piping bag or small baggie with a little black frosting and pipe out the details of his face. Before you know it, he's looking as mischievous as ever! I have to say, this project was a lot of fun. While there are a few things I would do a bit differently next time, I was really pleased with the results. It came together pretty quickly and was a hit at the party! Cupcake cakes are so much fun! This turned out beautifully. Thank you so much enjoy your trip! I think I said this already today, but you really are so talented and creative! Awwwww, thank you so much! You are too kind! I may just have to celebrate Christmas in July with this one!!! 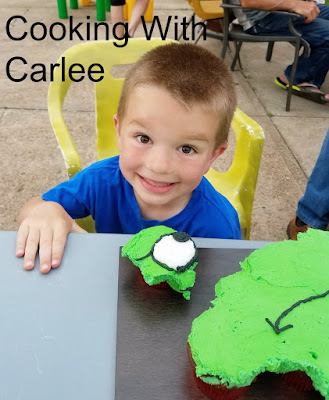 Hi Carlee, I love this idea of using cupcakes as a base for a novelty cake. It's perfect for little fingers (and big ones too) and each portion comes ready wrapped. They are so much fun to serve for sure! Thanks, Debbie!